So many smiles, so much laughter, such determination — it’s easy to see local kids love The University of Toledo’s National Youth Sports Program (NYSP). And they’re happy to talk about the summer camp that offers sports instruction and educational enrichment. 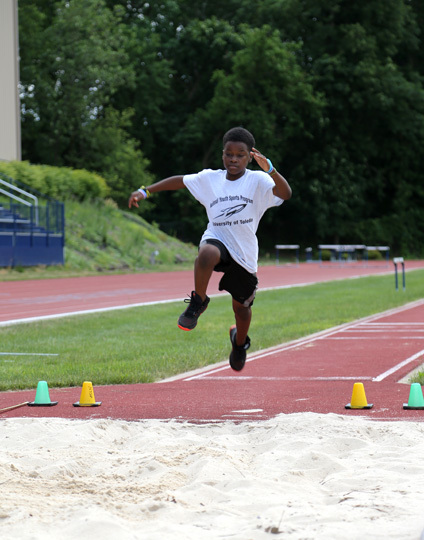 A camper soared through the air during the long jump on the track. “I like NYSP because I like track, and I get better and better every year,” Amarion Jordan, 12, said. “I love NYSP because of basketball, the new drills, and because we won the championship game,” Miracle Buchanon, 15, said and beamed. “What I like about NYSP are the different events — the talent show, going fishing, swimming and pool party, and ice cream,” Ariahnna Webb-Bragg, 11, said. Approximately 150 Toledo youths attended the program this year. 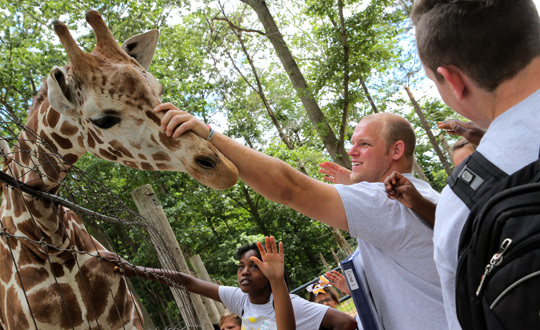 UT football player Nate Jeppesen, a counselor with the National Youth Sports Program, petted a giraffe during a field trip to Indian Creek Petting Zoo in Lambertville, Mich.
Kucharewski said even after federal funding for the program was cut, UT continued to operate the camp through fundraising, in-kind donations, and commitment from the University to provide some funding and facilities. This summer, youths enjoyed a wide variety of enriching activities, including the Hometown Heroes series, which brought in local speakers. UT Women’s Basketball Coach Tricia Cullop; Toledo fire fighters; Jordan Strack, WTOL sports and news broadcaster; and Scott High School Principal Carnell Smith talked to the campers. 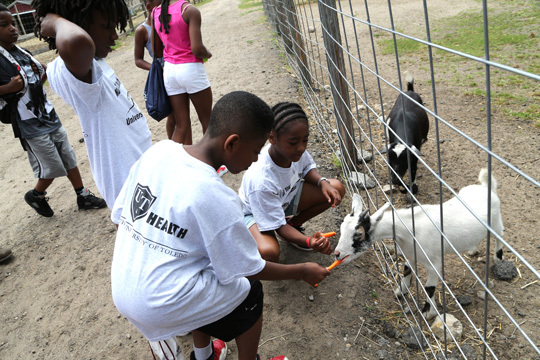 Children attending UT’s National Youth Sports Program fed goats during a field trip to Indian Creek Petting Zoo in Lambertville, Mich.
Copa cited recreational therapy as one of her favorite parts of the NYSP experience, since many of the campers would not have access to it otherwise. She spoke about the importance of teaching children not only how to be physically healthy, but to develop emotional health as well. For more information on NYSP, visit utoledo.edu/hhs/clinics/nysp. UT President Sharon L. Gaber, right, posed for a photo with this year’s National Youth Sports Program participants and counselors. 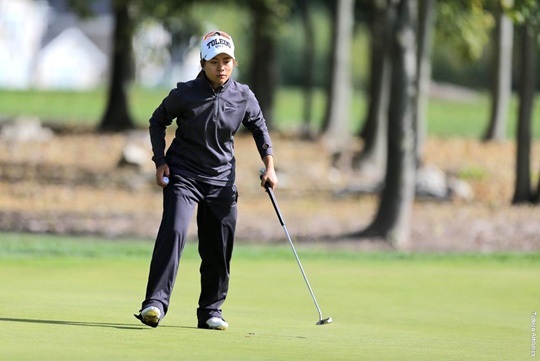 Five Toledo women’s golfers are off to good starts to their summer golf season, highlighted by four first-place finishes and junior Pinyada Kuvanun qualifying for the 2017 Summer Universiade. A 2016-17 second-team All-Mid-American Conference honoree, Kuvanun posted rounds of 70-71-72-72 to earn the right to represent Thailand in the tournament being held Aug. 19-30 in Taipei, Taiwan. Kuvanan also placed second among amateurs at the Singha Phuket Open with rounds of 73-72-70. Junior Pinyada Kuvanun has qualified for the 2017 Summer Universiade in Taipei, Taiwan. Another second-team All-MAC recipient, junior Pimchanok Kawil, has notched first-place showings at a Thailand Golf Association event (73-74) and the Chiang Mai Team Qualifier (73-67). Toledo’s remaining first-place finishes came from junior Natcha Daengpiem at the A-Class Open (73-76) and sophomore Saranlak Tumfong at a Thai LPGA Qualifier (72). Toledo will open its 2017-18 campaign at Ball State’s Cardinal Classic on Monday-Tuesday, Sept. 18-19. Grab comfortable shoes and step it up at lunch: Check out the new places featured in this summer’s 33rd annual Discover Downtown Toledo Walking Tours. 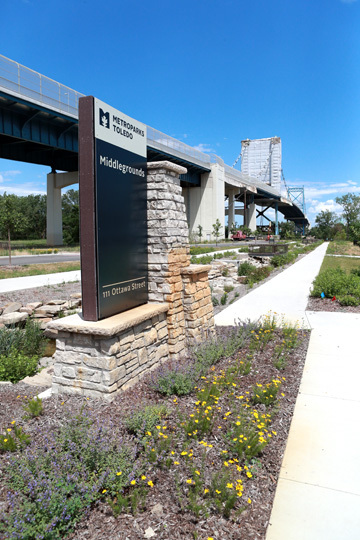 The free, public tours will be held rain or shine every Thursday from July 6 through Aug. 24 from noon to 1 p.m.
One of this summer’s new Discover Downtown Toledo Walking Tours is the Middlegrounds Metropark. Be there Thursday, July 27, to learn about the 28-acre urban green space that features a 1.5-mile path along the Maumee River. • July 6 — Fifth Third Building. See the view from Toledo’s tallest skyscraper. Meet in the lobby of One Seagate on Summit Street. Photo ID required for access to upper floors. • July 13 — The Oliver House, 27 Broadway St. Built in 1859, this is the Glass City’s oldest commercial structure in continual use. Learn how the building has been adapted over the years. Meet in the parking lot. • July 20 — Adams Street and Uptown. Walk along Adams Street from 10th Street to 18th Street. Meet on the Toledo-Lucas County Public Library’s north lawn at Adams and Michigan streets. • July 27 — Middlegrounds Metropark. See spectacular views of the city from Toledo’s newest park. Meet in the main parking lot, 111 Ottawa St.
• Aug. 3 — Westmoreland Historic Neighborhood. 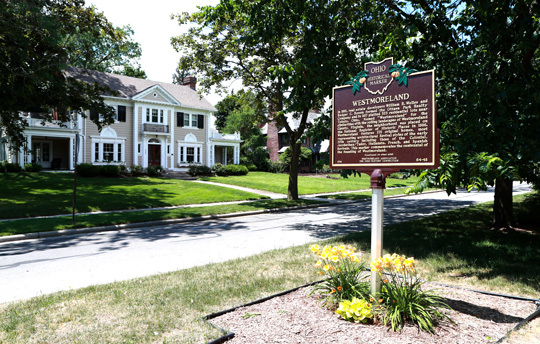 Experience one of Toledo’s most elegant early 20th-century neighborhoods; it is a local and national historic district. Meet on the center island at Mt Vernon and Grand avenues. • Aug. 10 — Collingwood Arts Center. One of the earliest homes of the Old West End grew into a religious complex and then into one of the city’s premier arts centers. Meet at 2413 Blvd. Parking available at center. • Aug. 17 — Royal Hotel. The new owners will discuss their restoration plans for the building. Meet in front of 337 Broadway St. Check out the homes in Westmoreland, which was placed on the National Register of Historic Places in 1986. Even if it’s not a beautiful Thursday, Aug. 3, bring an umbrella for the free walking tour. • Aug. 24 — Old Orchard Neighborhood. Discover how this area got its name, and learn about its streets, architecture and early residents. Meet at Kenwood Boulevard and Pemberton Drive; park near Kenwood. He added the tours are led by guides who are passionate about the city and trained in Toledo history and architecture. For more information, call the Toledo-Lucas County Public Library Local History and Genealogy Department at 419.259.5233. The Great Lakes Higher Education Corporation & Affiliates has awarded The University of Toledo a two-year, $420,000 grant to help low-income students who experience a financial emergency, such as an unexpected car repair or medical bill, focus on their studies and stay in college. The Dash Emergency Grant allows UT to provide emergency grants for up to $1,000 per student to help pay for unexpected costs within 48 hours of the approved application. UT is one of 32 four-year colleges in six states to be awarded $7.2 million in grant funding. A student must meet income eligibility guidelines in order to receive a Dash Emergency Grant. “Life is full of unexpected challenges, and this grant provides another tool for us to help students through those emergencies so we can keep them in the classroom and on the path to graduation,” UT President Sharon L. Gaber said. Dr. Michele Soliz, UT assistant vice president for student success and inclusion, focuses on strategic retention initiatives and will serve as program director. The UT Office of Multicultural and Student Success is hosting information sessions in July and August about how the application process works. The program will begin providing grants to students in fall 2017. Since 2012, Great Lakes Higher Education Corporation & Affiliates has committed $3 million to fund emergency grant programs at two-year colleges. This is the first time Great Lakes is providing Dash Emergency Grants to four-year colleges in Arkansas, Iowa, Minnesota, North Dakota, Ohio and Wisconsin. The University of Toledo Water Task Force is hosting a free, public event about algal bloom toxins and the impact they can have on people. Elizabeth Hamelin, analytical chemist for the Division of Laboratory Sciences in the Centers for Disease Control and Prevention’s National Center for Environmental Health in Atlanta, will give a talk titled “Monitoring and Measuring Human Exposure to Algal Toxins” Thursday, June 29, from 9 to 10 a.m. in the Center for Creative Instruction Room 1200 on Health Science Campus. Hamelin develops analytical methods to detect human exposure to toxins and poisons. “Elizabeth Hamelin is a collaborator on microcystin research projects at UT, and her visit to campus is a great opportunity for the community to learn how scientists are examining what safe limits are for the public,” Dr. David Kennedy, assistant professor in the Division of Cardiovascular Medicine in the UT College of Medicine and Life Sciences, said. Kennedy’s UT team is studying effects of algal bloom toxins on the liver using mice as a model. The UT Water Task Force, which is comprised of faculty and researchers in diverse fields spanning the University’s colleges, UT Medical Center and UT Lake Erie Center, serves as a resource for government officials and the public looking for expertise on investigating the causes and effects of algal blooms, the health of Lake Erie, and the health of the communities depending on its water. The task force includes experts in economics, engineering, environmental sciences, chemistry and biochemistry, geography and planning, and medical microbiology and immunology. Water quality is a major research focus at UT. With $12.5 million in active grants underway, UT experts are studying algal blooms, invasive species such as Asian carp, and pollutants. Researchers are looking for pathways to restore our greatest natural resource for future generations to ensure communities continue to have access to safe drinking water. Researchers and students help to protect the public drinking water supply for the greater Toledo area throughout summer algal bloom season by conducting water sampling to alert water treatment plant operators of any toxins heading toward the water intake. UT’s 28-foot research vessel and early warning buoy enable the University to partner with the city of Toledo and the National Oceanic and Atmospheric Administration to monitor the health of the lake and provide real-time data. This summer The University of Toledo will host a five-week coding boot camp for people interested in learning how to write software and pursue a career in creating websites, mobile apps and video games. The program hosted by Code City, a group of technology entrepreneurs in Toledo, will run from Monday, July 3, through Sunday, Aug. 6, in UT’s Launchpad Incubation in the Nitschke Technology Commercialization Complex. Participants will spend 30 hours per week during nights and weekends taking an online class to learn how to code. 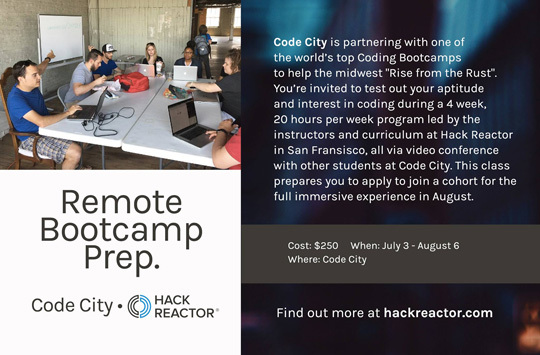 The Toledo program, which is San Francisco-based Hack Reactor’s pilot course in the Midwest, costs $250, and the registration deadline is Monday, July 3. For more information and to register, go to codecity.co/hack-reactor-remote-2. A librarian with more than 30 years of experience in academic libraries and museums will join The University of Toledo as the leader of University Libraries effective Aug. 1. Beau Case comes to UT from the University of Michigan Library. 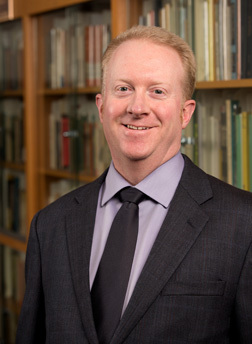 During his 15 years at the University of Michigan, he served as head of the arts and humanities libraries and collections managing a $7 million budget and as field librarian for classical studies. Prior to the University of Michigan, Case worked at Ohio State University as associate professor and head of the Linguistics and West European Languages Library. He also worked in libraries at Indiana University and the University of California at Los Angeles. Case has master’s degrees in library science and comparative literature from Indiana University and a bachelor’s degree in English from the University of California at Los Angeles. He is a member of the editorial boards of Cambridge University Press; ProQuest; Collection Building; and Library Collections, Acquisitions and Technical Services. UT University Libraries includes Carlson Library, Canaday Center for Special Collections and Mulford Health Science Library. Case is familiar with OhioLINK institutions thanks to his time at Ohio State. He also regularly visits Ohio because this is where his wife’s family lives. “It is a dream come true to have been selected for this position — everything aligns so nicely professionally and personally,” Case said. Barbara Floyd, who had served as interim director, is retiring from the University after 31 years. 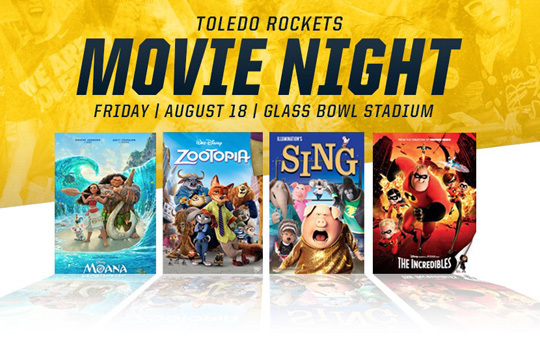 The University of Toledo will host a free movie night for the community in the Glass Bowl Friday, Aug. 18. The movie selection will be determined by fan voting on the official UT Athletics website at UTRockets.com. Fans may vote here through Friday, June 30. The winning movie will be announced Saturday, July 1. The movie will begin at 8 p.m. with gates opening at 6:30 for the opportunity to meet members of the football and volleyball teams. Throughout the evening, fans of all ages can check out activities, including color stations, inflatable bounce houses, obstacle courses, corn hole and more. Attendees may bring their own food and drink into the stadium. The concession stands also will be open. For more information about movie night at the Glass Bowl, call 419.530.4653 (GOLD). 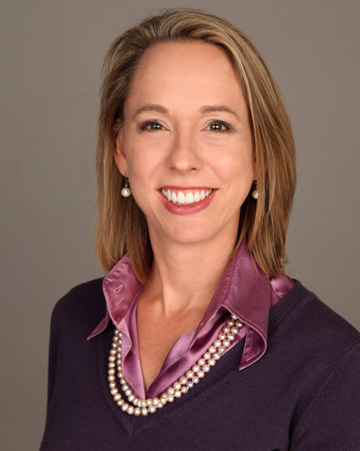 Wendy Davis has been named associate vice president of human resources and talent development. She has been serving in that role on an interim basis since November. Her appointment will be effective July 1. “Wendy’s strong leadership skills are an asset, and we are happy she will continue to oversee human resources,” said Larry Kelley, executive vice president for finance and administration, and chief financial officer. In 2015, Davis came to the University with strong experience in human resource management for public employers in Ohio. Prior to UT, she worked in human resources for Lucas County Children Services and Ohio Department of Rehabilitation and Correction — Toledo Correctional Institution. “I have enjoyed working in the Human Resources and Talent Development Department and am thrilled to continue to do so,” Davis said. Eduniversal, a global ranking and rating agency specializing in higher education, has again repeatedly included The University of Toledo College of Business and Innovation in its latest listing of Best Business School programs. • Executive MBA, ranked No. 47 in Executive MBA and MBA part time, North America. “We are very excited by these prestigious rankings, which validate the high quality of our faculty and students, as well as the significance of our curriculum,” Dr. Gary Insch, dean of the College of Business and Innovation, said. “The fact that our Supply Chain Program ranked No. 93 in the entire world is a truly remarkable achievement. The Eduniversal Evaluation System compiles and analyzes hundreds of data about business schools from global, national and regional higher education systems, taking into account the accreditations, the results of other rankings, and the distinctions obtained in the country of the schools analyzed. Eduniversal (best-masters.com) has been working since 1994 to provide schools and students with the best information possible in the higher education sector. The Eduniversal ranking is published once a year and was announced at its recent annual world convention.